James M. Beidler came by his German genealogy expertise honestly – it took him more than 20 years of searching to find any ancestry that wasn’t from Germany! Beidler is a columnist for German Life magazine and is considered a go-to person for German genealogy articles and lectures. He has written two books on researching the genealogy of German-speaking peoples. He also has expertise in the genealogy of the people of his native Pennsylvania, newspapers, and land records. 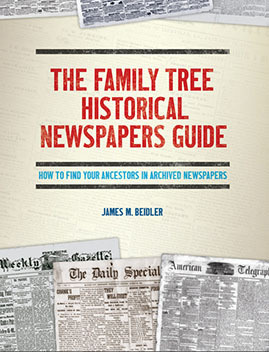 Search for your ancestors in historical newspapers with the tips and techniques in this guide, brought to you by author James M. Beidler, who was uniquely qualified to write the book as a first-career newspaper copy editor – he has seen “how the sausage was made!” Inside, you’ll learn how to use Newspapers.com, GenealogyBank and other online newspaper databases to discover your family history and learn about your ancestor’s life and times. 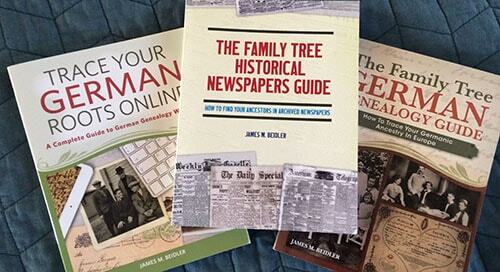 In addition, you’ll learn more about offline historical newspaper resources, too, and benefit from the research flow chart included in the book. When it comes to newspapers, obituaries should be the research starting point – not the ending point! You can build biographies of your ancestors one sentence at a time through newspapers! Read Roots & Branches, the only syndicated weekly column on genealogy in Pennsylvania – featured in the Altoona Mirror. 5th Edition Now Available. The book offers practical information regarding methodology, case studies, websites, record groups, DNA, newspapers, and more. It’s organized by category—perfect for small snippets of reading time or a cover-to-cover binge. Among the presentations on genealogy that I offer is one titled Hints and Helps: My List of Top Tens.